Click here to login and send a print job to any of the residence hall computer labs. There are two basic ways to check your Northland email. Select web mail at the bottom of this page. Alternatively, you can go directly to the email log-on screen at http://mail.northland.edu. When the logon screen loads, sign in with your Northland email address (i.e., smithj972@myemail.northland.edu) then type your password. By receiving a user and email account, students are agreeing to abide by the Northland College IT Department Code of Ethics and all applicable policies. Any violation of this contract may subject you to a suspension of computing privileges and/or prosecution under College conduct codes and/or appropriate state and federal laws. There is no additional charge for residence hall Internet connections. Fees are built into the Northland College housing fee. Cable: Students will need a Cat5 network cable. Cables can be purchased from a hardware/electronic store or from the IT Department. The IT Department has 25-foot cables for $5 each. Connect: Students may plug a Cat5 network cable into their personal computer and into the network port on the wall. Antivirus: Northland College requires a valid antivirus program on all computers. If students do not have any antivirus software, it is highly recommended by the Northland College Information Technology Department to install one of the many freely available programs. Not using anti-virus software puts personal computers at risk of serious damage and loss of data. If you need assistance installing one of these programs please contact the IT Help Desk at 715-682-1855. Each residence hall room is equipped with cable for TV. It is suggested that students acquire an adaptor and/or extra cable for their television from a vendor in town. Students must not alter or tamper with the cable television connection in any way. Any problems with the cable connections should be reported to the RA or RHD. Satellite dishes are not permitted in/at any Northland College residential unit or room. In the fall of 2014, Northland College replaced the old analog cable television system with a state-of-the-art digital HD cable system throughout all of our residence halls. We have a total of 61 network offerings all in high definition. Please note that the older analog television models will not work on campus without a very specific (QAM) digital-to-analog converter box. These converters are becoming increasingly difficult to find, and are fairly costly. The typical digital converter that you use at home, and was likely purchased at the local big-box store, will not work. Because of this fact, we recommend that you bring a fully integrated HDTV to campus with you in order to experience the true quality of digital HD broadcasting. For further questions, contact the help desk for assistance. Students must supply their own television and coax cable cord. The length of this cable can vary based upon the residence hall you are in, and how far away you locate your television from the outlet. If you are not already sure of the length you will need, we would recommend that you bring a 25′ cord to be safe. 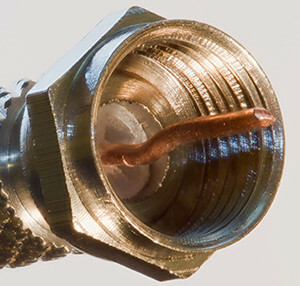 NOTE: When attaching the coax cable at the outlet and on the television itself, make sure the cable is hand-tightened only. Over-tightening, as well as under-tightening can produce poor signal quality. 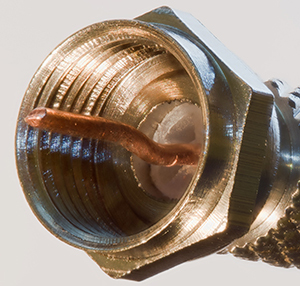 Also take caution that you do not kink or bend the coax cable as this can also contribute to a grainy picture. If the connector on the wall plate in your room is loose, please contact the help desk for assistance. If you are planning on bringing an HDTV from home, or purchasing a new one, make sure that it is a fully integrated model with a QAM tuner, which is necessary to receive digital broadcasts over a physical piece of cable (coax cable). We are finding that many of the newly manufactured, lower end TV models, are not including the QAM tuner in order to cut costs. Be sure to ask your sales person this question before purchasing a set to bring to campus. If you are bringing a set from home, you can contact the manufacturer support line (links included at the bottom of this page) along with the model number in order to determine if the set has a QAM tuner installed. NOTE: Most digital televisions manufactured between 2006 and current, will likely be equipped with the QAM tuner, but as noted above, not in all cases. Please note that Element brand TVs typically DO NOT have a QAM tuner. If you have any questions about the new digital service, or to find out if your television has a digital QAM tuner in it, please email tech support at: techsupport@northland.edu with your television brand (LG, Sony, etc), model number, and manufacture date. This information can usually be found on a label on the back of the TV. 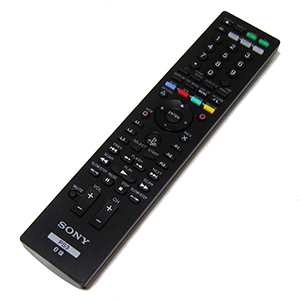 Once you connect your coax cable, we recommend that you use your remote to do some on-screen menu programming. 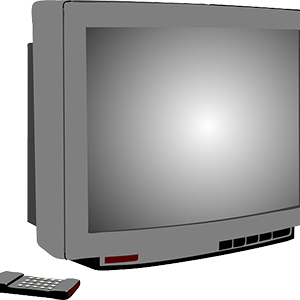 Exact details on how to auto program or auto tune digital TVs vary from manufacturer to manufacturer and from model to model. These instructions are generalizations that are meant to describe the way most TVs accomplish this feature. For best results, refer to the owner’s manual for the specific TV you are working with. Most TVs will take between 5-10 minutes to complete this function. NOTE: If you see an option to select “Antenna” at any point of your on-screen programming, choose the “Cable” option. 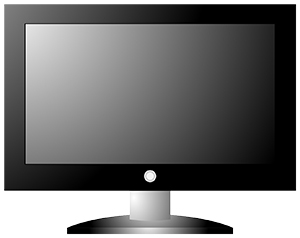 Every television uses different terminologies, so you might need to poke around for a while until you find what you are looking for. Some television manufacturers (Westinghouse for example) may also require you to enter a “Channel Access Code” (or QAM code) in order to do a channel search. Refer to your manufacturers support page to obtain the code. Submit a help desk ticket. Learn more about the personal wireless router policy. The Northland College Information Technology Department does not troubleshoot or fix students’ personal computers for non-network related issues. However, if students have a problem with their computers, they can bring it to the Northland College Information Technology Department. A technician will look at the problem with the student and make some possible solution suggestions. It is up to the student to get their computer repaired. There are phones located in every residence hall room and in locations across campus. To call from an on-campus phone to another on-campus phone, dial the last four digits of the phone number (e.g. to reach the Office of Residential Life, dial 1272). Local calls can be made from most phones by dialing “8” followed by the ten digit number. Students cannot bill calls to their rooms and cannot accept collect calls. Students must use a personal calling card to place long distance calls.